A batch of these is a great way to use up egg whites. Plain macaroons can be made by omitting the rosewater. They make a good sweat treat to serve with coffee, particularly at the end of a Middle Eastern styled meal. Sometimes I make half plain and then add the rosewater and pink colouring to the remaining mixture. *The intensity of rosewater can vary, start with a teaspoon and then add more as required. Add about ¼ of the sugar and beat, gradually add remaining sugar and continue to beat until the mixture stiff. Mix in coconut, vanilla and rosewater. Tint the mixture with pink food colouring if desired, one drop of food colour at a time until desired colour is achieved. Place heaped spoonfuls of the mixture onto a tray lined with baking paper. 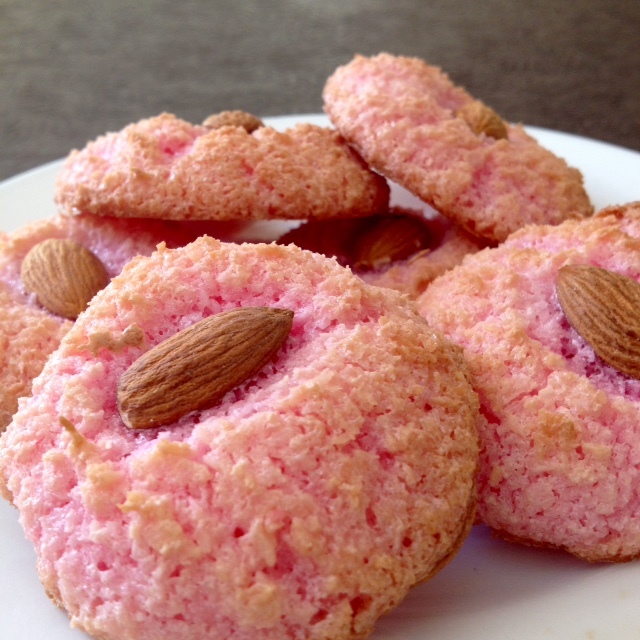 Optional - Place a cherry half or almond in the middle of each macaroon. Bake the macaroons in 150/160 deg C oven until cooked and starting to turn a light golden brown, approximately 15 minutes. Try not to allow the mixture to colour too much, if getting too brown turn oven down and open oven door for a few minutes to allow some of the heat to escape. Cool on tray for a few minutes and then on a cooling rack.